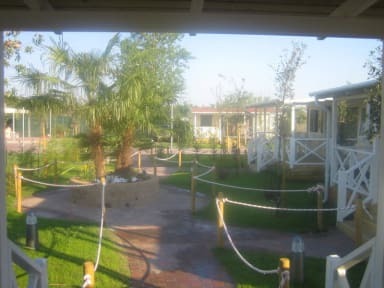 Camping Villaggio Atlanta e Mediterraneo is located in Sottomarina di Chioggia , just 3 km from Chioggia,and 50 min from Venice, a charming town in the Venetian lagoon, called the little Venice for its streets, its palaces and its canals. Inside the mobile home you will find a double bedroom and two other bedrooms with single beds for a total of 6 beds, a living area with sofa and kitchenette, one or two bathrooms with a shower and a bidet. They are equipped with every comfort such as an air conditioning, a flat screen TV, in the kitchen, stove, oven, microwave, coffee maker and a complete cookware. Our camping village is adequate to meet every need for comfort, including camping pitches surrounded by greenery and modern homes ideal for those who want a more traditional accommodation. The park pools are a fun way to effectively beat the summer heat, including an Olympic swimming pool for adults and one dedicated to children with fun water games. The animation is always professional and it is never pushy, and it will brighten up your days with different activities. Sports enthusiasts will be able to compete on the beach volleyball court or organize tournaments on table tennis. A Bar, restaurant, pizzeria and a supermarket are available for all the services you may need including a children's playground, situated directly to the beach.